You are here: Home / Ent. / R.I.P. Stan Lee; My Favorite Marvel Games. R.I.P. Stan Lee; My Favorite Marvel Games. (ThyBlackMan.com) As a young kid growing up on Jackson St., I remember watching my very first ever Marvel cartoon show in X-Men that was very balanced in the sense of Wolverine and Cyclops constantly being at odds over who should lead the X-Men as well as which one of them is more deserving of Jean Grey’s heart. One major part of Stan Lee’s comic book career that many black people don’t know about is that Stan Lee and Jack Kirby created X-Men in 1962 during the peak of The Black Civil Rights Movement particularly in The South and actually created two characters who would become frenemies over the course of the story: Charles Xavier was based on Martin Luther King who believed that humans and mutants such as The X-Men should peacefully co-exist while Magneto who was based on Malcolm X believed that all mutants should be liberation from the discrimination and oppression they often face at the hands of the humans. Stan Lee and Jack Kirby saw the racial oppression that blacks face daily at the hands of whites in this country so they decided to make the mutants in the story of X-Men based on the struggles and oppression that us as black people face in America on a daily basis by the colonial social system. Therefore black people are the real life mutants. Stan Lee left behind a legacy in the comic book world that’ll never ever be touched because he knew exactly what works and what didn’t work and that’s what made him immensely successful in the comic book industry throughout these past five decades. Here are my favorite Marvel games. 1. X-Men (Arcade) – This was another arcade game that I truly enjoyed playing at the pool room back in the day because this was basically one of my favorite genres of video games which is beat em’ up. This game had 5 playable X-Men to choose from which includes my two favorite X-Men in Storm and Wolverine. One of the things that I definitely enjoyed about this game that stood out from other beat em’ ups at the time was the fact that you can knock down your enemies and while they’re down, you can continue to kick them while they’re down until they’re defeated and then you could even do special attacks like the optic blast from Cyclops to the laser claw from Wolverine. you couldn’t beat down boss characters that were down like Fiero, Juggernaut, Emma Frost, Mystique, and Magneto. The Japanese version of the arcade was much easier than the U.S. version that had much shorter stages and energy recovery item while the U.S. version was much tougher with longer stages and no energy recovery items. 2. Marvel vs Capcom (Arcade, PS1, Sega Dreamcast) – I remember when I first played this game back on The Sony PlayStation during my middle school days, I was absolutely terrible in it, but as I got a bit more older, I got more better in learning the basic fundamentals of any fighting game: super attacks, air combos, assists, etc. One of the tricks that most gamers didn’t know about this fighting game was that Wolverine is the only character from Marvel vs Capcom that was able to do three hyper combos at one time because you had to make sure to do all three of them correctly that takes about half of the vitality off of your opponent. And doing the trifecta hyper combo with Wolverine was absolutely sick back in the day. 3. Spider-Man/Venom: Maximum Carnage (SNES/Sega Genesis) – I remember when I was in my teens I would often play this game for the Sega Genesis and I have so many memories of playing this game because like some of the other beat-em-ups that I’ve personally played over the years including my favorite all time beat-em-up game in Streets Of Rage 2, Maximum Carnage was a beat-em-up game where you would play as either the heroic Spider-Man or his arch-nemesis Venom in a rare team up to take down the main antagonist in the game named Carnage. The gameplay mechanics reminded me heavily of Streets Of Rage 2, but in this game, when you land numerous successful hits against your enemies, your vitality bar will start to flash and once it flashes extremely rapidly, you get to unleash your most powerful super attack in which Venom’s is my favorite one because during his most powerful super attack, he smashes the ground doing massive damage to all of those around him and I absolutely loved doing that super attack so much. This game is definitely a classic and one of my personal favorite beat-em-up games. 4. Marvel Future Fight (Mobile) – Earlier this year, I tried out this new Marvel game on mobile that I heard so much about called Marvel Future Fight. It’s basically a beat-em-up game with RPG elements added to it that bring more diversity and flexibility to the characters in the game. You can play as over 100 Marvel Super Heroes and Super Villians to create your ultimate team. The game also has a good bonus effects feature that triggers after you build classic teams like X-Men that would either increase your HP, attack, or defense which is a very cool feature that I greatly enjoyed about the game. Another cool feature that I liked about this game is the fact that not only can you upgrade your characters in Epic Quests, but you can also choose from over 100 of hero/villain uniforms to even increase your character’s special powers and change the character’s appearance. This game was so much fun when I used to play it even though I don’t play it very much nowadays. 5. X-Men: Mutant Apocalypse (SNES) – This was also another Marvel beat-em-up game where you would choose to play as one of iconic X-Men characters such as Wolverine and Cyclops. The thing about this game that stood out from the other beat-em-up games at the time was the fact that when you played as an X-Men character, they would be in different stages like Wolverine would be in the Sentinel factory stage and Cyclops would be on the stage riding on the train. The toughest fight that I ever had in this game was against Magneto who is the final boss of this game just like he was the final boss in the X-Men arcade game. 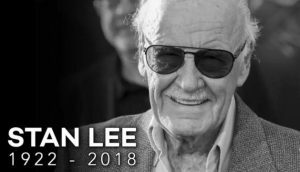 The Conclusion – Marvel was a big player during Stan Lee’s life and will always be a big player in his after life because no other mainstream comic book artist will ever be able to fill the huge shoes that Stan Lee left behind.